With guest speaker Nell LEyshon alongside winsome pinnock and John Stuart. About the event : The theme for this event was Remembering, bringing together three remarkable speakers, each acclaimed in their fields of fiction, theatre and history respectively. Each of the three speakers responded with quite brilliant talks and performances. 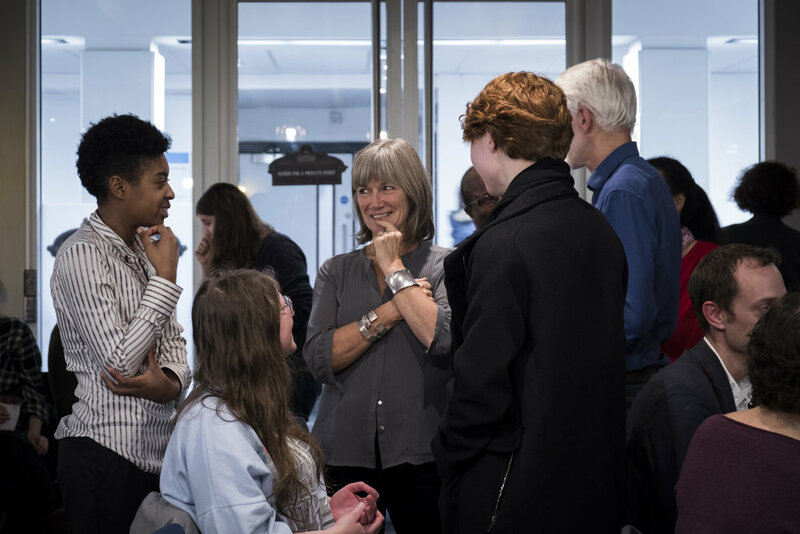 The event was opened with the launch of Strays, a new book by James Miller, senior lecturer in creative writing at Kingston, and Julia Rose Lewis, recent alumni. Videos below, and pictures by Madeleine Elliott. About the speakers : Nell Leyshon is a novelist and playwright. Her first novel, Black Dirt, was long-listed for the Orange Prize and short-listed for the Commonwealth Prize. Her third novel, The Colour of Milk, was published by Penguin in May 2012 and has since been translated into multiple languages. It won the Prix de l’Union Interalliee and was nominated for the Prix Femina in France. In Spain it won Libro del Ano, book of the year. Memoirs of a Dipper, her fourth novel, was published in 2015. Nell’s first play was runner up for the Meyer Whitworth Award and her second play, Comfort me with Apples, won an Evening Standard Award for the most promising playwright, was shortlisted for the Susan Smith Blackburn Award, and nominated for an Olivier Award. Her play Bedlam was the first play written by a woman to be performed at Shakespeare’s Globe. She has written for National Theatre Connections, Theatre Newfoundland and Labrador, Theatre Royal Plymouth, RADA and Teatro Nacional of Peru. Her first opera libretto was for Streetwise Opera, who work with the homeless. Her extensive radio work has been commissioned by BBC Radio 3 and 4. Her first play won the Richard Imison Award. Nell’s first one woman show will be produced by the Royal Shakespeare Company in 2018. Nell worked for many years with marginalised communities, teaching and facilitating creative writing and performance. She was on the Management Committee for the Society of Authors, and is currently on the board of Shakespeare’s Globe. John Stuart is course director for History at Kingston University. He specialises in the history of the British empire and Commonwealth and in world history. His research interests are varied, but have focused mainly on the activities of British missionaries in Africa and other parts of the non-western world. At present he is researching religious humanitarianism in the mid-twentieth century. He is a co-convener of two research seminars at the Institute of Historical Research, London, on Imperial and World History and on Christian Missions in Global History. Winsome Pinnock’s stage plays include Glutathione (Young Vic Theatre) The Principles of Cartography (The Bush Theatre) Tituba (Hampstead Theatre) Cleaning Up (For Clean Break at Oval House Theatre), Taken (For Clean Break at Oval House Theatre) IDP (Tricycle Theatre) The Stowaway (Play for young people, Plymouth Theatre) One Under (Tricycle Theatre) Beg Borrow or Steal (Kuumba Community Arts Centre) Water (Tricycle Theatre) Mules (Royal Court Theatre Upstairs and Clean Break Theatre) Can you Keep a Secret? (Connections at Royal National Theatre) A Rock in Water (Royal Court Theatre) Leave Taking (Liverpool Playhouse Theatre) A Heroes Welcome (Royal Court Theatre Upstairs) The Wind of Change (Half Moon Theatre) Picture Palace (Womens Theatre Group). Radio plays include Clean Trade (Radio 4), Lazarus (Radio 3), Her Father’s Daughter (Radio 4) Let Them Call it Jazz (adapted from Jean Rhys’ short story, Radio 4) Indiana (adapted from novel by George Sand) The Dinner Party (Radio 4) Something Borrowed (Radio 4) and Water (Radio 4). She co-wrote the screenplay Bitter Harvest and is currently commissioned by the Bush Theatre, London. Awards include the George Devine Award; Pearson Plays on Stage Scheme best play of the year Award; Unity Trust Theatre Award. She was runner up Susan Smith Blackburn Prize. She was Senior Visiting Fellow at Cambridge University and writer in residence at Holloway Prison, Clean Break Theatre Company, Royal Court Theatre, Kuumba Arts Community Centre, Tricycle Theatre, and The Royal National Theatre Studio. She is currently Associate Professor at Kingston University. Julia Rose Lewis is the author of the poetry pamphlets Zeroing Event (Zarf Poetry 2016) and Exhalation Halves Lambda (Finishing Line Press 2017). Her first collection is forthcoming with Knives Forks and Spoons Press.